In the South West Regional Finals held at the South Devon UTC 31st January, the experienced team from Thomas Hardye came first in their group, and the rookie team came second in their group – a fantastic result and reward for their hard work in Future Engineers STEM Club! Etienne is the Future Engineers club leader and experienced Panthers team leader. It is completely student-led but we have had help from Dave Cheffey and also a STEM ambassador from Poundbury Systems, Steve Howes has been on hand to help problem-solve. 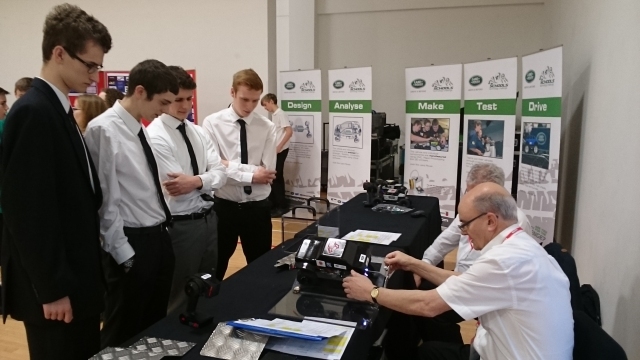 The Future Engineers Club, led primarily by sixth form students, enters this challenge each year. Using a kit, the students ‘Design, Analyse, Make, Test and Drive’ their customised vehicle and are assessed for each stage of their performance including the challenge of seeking sponsorship! The two levels of competition are: “experienced” for those who have been before – this expects more customisation and building than the other “rookie” competitors who can race their kit car without modification. It is especially valuable as a club as it gives students the chance to nurture their interest in engineering across the science, technology, computing and maths divisions and grow in confidence, develop their team skills with enthusiasm and work to deadlines culminating in the competition. Support was also provided thanks to Arkwright funding in respect of Matt Torok’s Arkwright Scholarship. The 12 competitors will receive Silver CREST Awards in reward for their efforts. We are grateful to Mike Januszewski for taking them there (very early start!) and he is willing to take them to Silverstone, if we can sort out the finances and permissions and can seek potential sponsors to help with the costs!